With Cubase 5 LE and a bizarre GM soft synth (PC-only) also in the box, this is a decent package at a fair price. Solid build and decent sound. Crackle issues on our test model; less full-featured for OS X. Solid and quite heavy, this angular metal box feels like it could survive a nuclear war. The Studio 22 Pro's two XLR/jack combo inputs and two 1/4-inch jack outputs are supplemented by two pairs of phonos, with outs mirroring the outputs and ins mixed with the inputs. The box also features MIDI I/O with activity monitor indicators, 48V phantom power and buttons to switch between instrument and line level signals. Main out and headphone volume levels are set independently, and direct monitoring is controlled by a Mix knob. Annoyingly, our test unit exhibited a bit of crackle at the anticlockwise end of the Mix knob's range. Audio quality is impressive, albeit limited to 16-bit/44.1kHz under OS X. 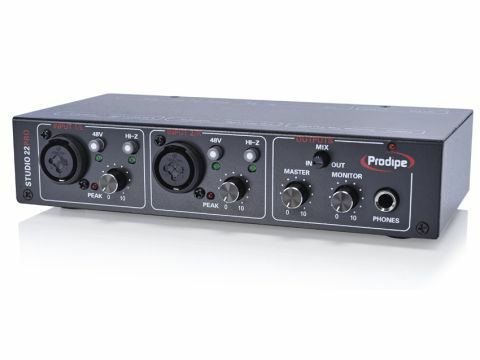 Windows users can download the ASIO driver from the Prodipe website for latency as low as 2ms, the ability to combine up to four Studio 22 Pros and higher bit-depth recording.